This is the second post in a series on saving during different stages of your life. You can go ahead and read the first post in the series about saving in your 30s, or go on to read about saving in your 50s. You’ve moved out of your 30s and into your 40s, which means it’s time to reevaluate your finances. 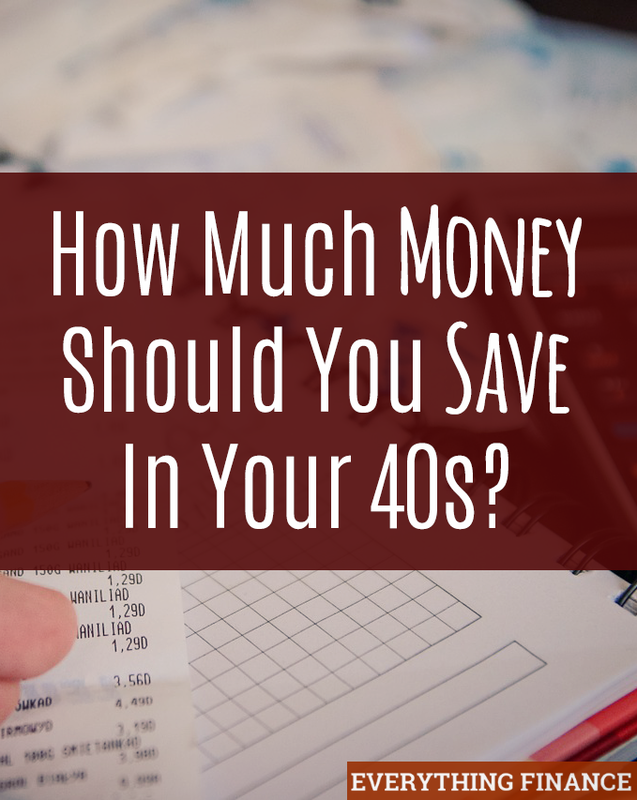 If you’re approaching your 40s and feel like you don’t have a good hold on your savings, now is a good time to make goals and plan for the future. Some considerations you must make for saving in your 40s include retirement, continuing to grow your wealth, saving for college if you have children, and new ways to diversify your assets, such as investing in real estate, businesses and other tangible property. Finally, now that your retirement in your 50s or 60s is closer than when you were in your 30s, you should consider talking with a financial advisor to build a plan to meet your goals. In your 40s, it’s important to determine if you’ve saved enough for retirement before going after any other investment options. If you’re not maxing out your retirement accounts, you’re not saving enough. According to Bankrate, 35% of workers between the ages of 45 to 54 have less than $25,000 in retirement savings, and more than 6 out of 10 have less than $100,000. If you’re not saving enough for retirement by the time you’re in your 40s, the best approach is to begin putting more of your paycheck towards your retirement savings. While you may not benefit as much from compound interest as you would have if you started saving for retirement in your younger years, it’s imperative to put a larger percentage of your wages towards retirement now so you can still make up the difference. If you’ve been maxing out traditional retirement accounts, then read on to find out how you can grow your wealth through other avenues. Now that you’re in your 40s, you’re likely looking for new investment ventures that can expand your wealth. These might include rental properties, new investment vehicles like ETFs, and investing in businesses. It’s good to have an overview of your options before you get started in order to know your risk and any benefits or drawbacks that might occur. If you’re interested in growing wealth with rental properties, getting into real estate investing might be for you. Although the economy is recovering, many people are putting their money into real estate because of low interest rates and a higher number of foreclosures and short sales. According to Forbes, estimates from The National Association of Realtors found that investors accounted for 27% of home sales in 2011, up from 17% in 2010. One potential pitfall of having rental property is maintenance and upkeep. You may have to work with contractors or a property manager to keep the rental in tip-top shape, or you may have to do repairs on it yourself. Depending on how much you’ve done with the property to bring it up to code for renters, this could be costly. However, having a cash flow positive property also makes it possible to use your rental income to reinvest in the property. Another factor you have to consider is that you’re becoming someone’s landlord. While this may not be a financial consideration, you should have a written agreement with your tenant(s), treat the relationship like a business relationship, and brush up on your people skills so you can resolve any conflicts that arise. How much of an investment should you make in rental properties? That’s up to you and your financial planner to decide. However, if you decide to rent property out, it could be a rewarding experience, financially-speaking. Investing in rental properties becomes easier as you go along, so you could choose to own and rent multiple rental properties down the road. This will allow you to turn a hefty profit, all from some good investment choices you made when changing your savings strategy in your 40s. Another real estate venture you might consider is flipping homes. If you’re not familiar with the concept, it’s when you buy a fixer-upper, invest in it by repairing and making updates, and then sell it for a higher price, thus gaining a profit. A simplified example would be buying a home that costs $150,000, spending $20,000 on repairing it, and then selling it for $230,000, earning $60,000. You might take on this enterprise by yourself, or with a group of people, in which case you’d need to agree on how to split the profits. Flipping homes can be a viable investment strategy and is growing in popularity. According to RealtyTrac, more people are flipping homes in less time and returning larger profits. Homes flipped in 2013 accounted for 4.6% of all U.S. single family home sales during that year, and the average gross profit for a home flip was $58,081, up from $45,759 in 2012. Although it’s risky to put your money in real estate, any investment involves some sort of risk, and flipping homes may be a good option for a short-term investment strategy with some higher yield gains. This is especially true if you’re handy and can complete repairs on your own, keeping costs down. In your 40s, options like rental property and flipping homes allow for your savings to grow, and they give you assets you might wish to pass onto relatives later in life, or sell for a profit. So you’re interested in investing, but real estate isn’t appealing to you. What other options exist? If you’re in your 40s and want some stock in the decision making, planning, and direction of a company, investing in a business may be something you’d like to pursue. There are two types of investments you might make in a business. You may provide an equity investment, or you may provide a debt investment. Equity investment gives you ownership in a company. According to About Money, an equity investment provides equity, usually as cash, and the investor receives a percentage of profits and losses. In contrast, a debt investment is a loan to a business with the promise to receive interest income and repayment on the principal. Like with any investment, business investments come with risk. It’s possible the business could go under, resulting in total loss of investments. However, the business could also boom and result in profits for you. It’s your choice to decide whether the business is worthy of your investment. What should you do with your savings in your 40s when real estate and small business investing isn’t appealing? It might be a good time to invest in Exchange Traded Funds (ETFs) if you haven’t already. An ETF is similar to an index fund in that it provides you a return at minimal cost to you, and they trade commission-free. According to a Forbes article from 2013, the net assets held by ETFs amount to $1.34 trillion. That number is likely to increase in 2015. ETFs are a flexible investment option which gives you the freedom to diversify your portfolio without incurring the fees of traditional index funds. Thinking About Saving for College? Are you planning on helping your children afford their college tuition? While there are many financing options available for college students (including grants, scholarships, and federal and private student loans), using money that has been set aside for education expenses is the most cost-effective way to finance college without the burden of debt later on. Many grants and scholarships are essentially free money for college students, but they can be competitive and sparse. With a little planning, you can set your child up for success in college and worry less about funding their way with a college savings plan. They will also worry less because they can focus on earning their degree, taking vocational courses, and seeking out the career they want with less debt than their peers. There are a variety of savings vehicles available, and each has benefits and drawbacks. The variety of plans out there includes 529 college savings plans, Uniform Gifts to Minors/Uniform Transfers to Minors Accounts (UGMA/UTMA), and Coverdell Education Savings Accounts. One of the most common college savings plans, a 529 plan is a tax-advantaged account designed to pay for qualified higher education expenses. 529 plans can be used for a student of any age so long as the expenses are related to education. A 529 plan does have some contribution limits you should be aware of. For example, according to the IRS Questions and Answers page on 529 plans, you may face gift tax consequences if your contributions, plus any other gifts to a particular beneficiary, exceed $14,000 during the year. If you’re interested in setting up a trust for a minor, a UGMA/UTMA account may be a good option. These types of custodial accounts are in the child’s name, and they also allow parents to transfer assets like stocks, bonds, mutual funds, annuities and life insurance policies to children. While a UGMA/UTMA account provides funds for college, there are drawbacks. According to the FinAid website, custodial accounts like UGMA/UTMA are considered assets of the student and may lessen the amount of financial aid they receive. Like the UGMA/UTMA accounts, a Coverdell Education Savings (ES) account is a custodial account a young person can use for college expenses. If your modified adjusted gross income (MAGI) is less than $110,000 ($220,000 if filing a joint return), you might be able to open an account. However, total contributions for the beneficiary in any year cannot be more than $2,000. If your children are younger, this amount can help them with any elementary or secondary education expenses, too. If you’re in your 40s, your child might be approaching the age where they need college funds for school. It’s imperative to make sure you save up the percentage you wish to use, whether it’s half of the student’s expenses, 75% of the expenses, or the full expenses. Don’t forget to consider your retirement needs, though. You should make sure you’re saving enough there before committing to saving a lot for college expenses. It’s important to have a handle on your savings and investments in your 40s so that you’re on track for retirement in your 50s or 60s. While you might want to try alternative investments such as real estate or individual stocks, you should be maxing out your traditional retirement accounts beforehand. If one of your goals is to secure the future of your children and set them up for success in educational pursuits and beyond, then prioritize saving for college as well. Feeling overwhelmed on how to go about saving and prioritizing your goals? Consider talking with a financial adviser to get a better handle on things.